Admiral Ackbar to Return in Star Wars 8? While we know that most of the new cast from Star Wars: The Force Awakens is returning for Star Wars: Episode VIII, we haven't heard about some of the more iconic secondary characters from the original trilogy who returned for this new sequel. We now have word that Admiral Ackbar is most likely going to be making his third appearance in a Star Wars live-action movie. A number of Resistance actors from Star Wars: The Force Awakens were scheduled to appear at the upcoming Pensacon. But two of these actors have had to pull out at the last minute. One of them was expected. As we saw at the end of Star Wars: The Force Awakens, Chewbacca and R2-D2 accompanied Rey to Luke Skywalker's secluded retreat, where the action will pick back up in Star Wars: Episode VIII. So it makes sense that Chewbacca will be a big part of this story. While Joonas Suotamo has taken over the heavy lifting for original Chewbacca actor Peter Mayhew, it sounds like Mayhew has not fully handed over the reigns of his iconic character just yet. He was pulled out of Pensacon alongside actor Tim Rose, who plays Admiral Ackbar, so that they could shoot a new project together. It has not been confirmed that the project is, in fact Star Wars: Episode VIII, but all signs point to that being the case. Pensacon takes place February 19-21, which lines up with the Star Wars: Episode VIII shoot. Also set to appear at the convention are Jessica Henwick, who plays Jessika Pava, and Mike Quinn, who plays Nien Nunb. There participation is still up in the air, but if they also pull out, this is a good indication that both characters will return in Star Wars: Episode VIII. The official PensaCon released this statement. "Unfortunately, we have some bad news to report this morning, but we prefer to let you know as soon as we know something is happening. Both Peter Mayhew and Tim Rose have been called to report to London for a film project they are working on (It "8" our guests... Wonder what it could be?) and will not be able to attend Pensacon this year. Both send their regrets. We are not sure if this will effect two of our other guests, but we will keep you posted. We are working to book some new guests on short notice, if we can. Thanks for your understanding." It has been speculated that Joonas Suotamo will completely take over for Peter Mayhew at some point, but for now it looks like the original Chewbacca may be appearing in all three new trilogy movies. Joonas Suotamo may go it alone when it comes to the Star Wars Anthology: Han Solo movie, but that hasn't ever been confirmed or denied. So, what do you think? 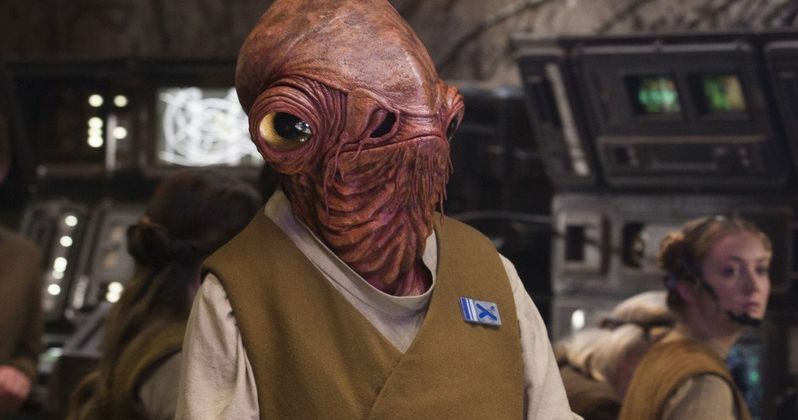 Are you happy to see ol' Admiral Ackbar returning yet again for another live-action movie?